I'm definitely head over heels in love with the postcard print that came out this summer from J. Crew! In fact, I'm so in love with it that I own three pieces that feature the print: this bow top, a blouse, and a skirt that I'll be featuring soon on my blog. I actually thought I had bought everything I possibly could with this particular print only to realize yesterday that there is also a dress! While I am tempted to get the dress to complete my collection, you can easily convert the blouse and the skirt (I think J. Crew calls that type of matchy, matchy thing "the hookup") into something that resembles a dress, so I think I'll pass...at least for now. At first I was going to style this outfit with a graphic black and white skirt but then I decided to play up some of the colors featured in the print. 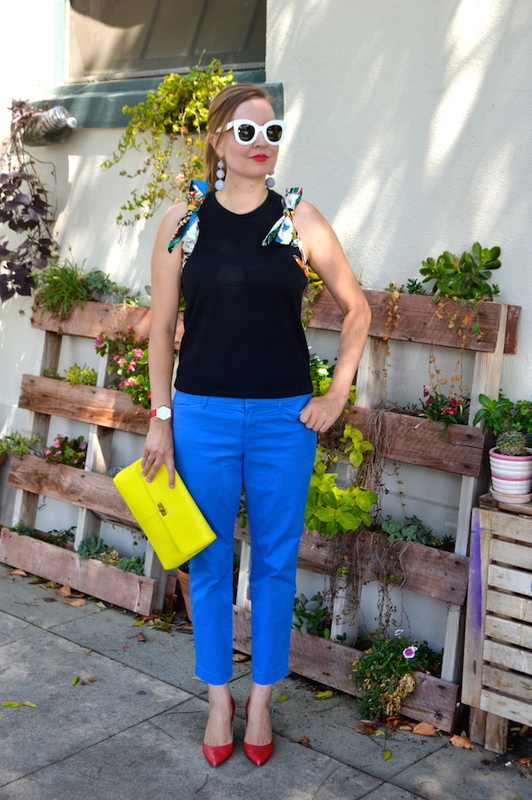 I thought the addition of primary colors such as these cobalt pants and red heels gave a much needed pop of color to the look. The endless styling possibilities is one of the reasons why I adore this postcard print so much! Apparently, I am not the only one who adores the print because when my husband took these pictures outside of a small Japanese restaurant, the owner came out and applauded! Maybe she liked the outfit or maybe she just wanted us to come in and have some sushi! Those bows are so adorable! 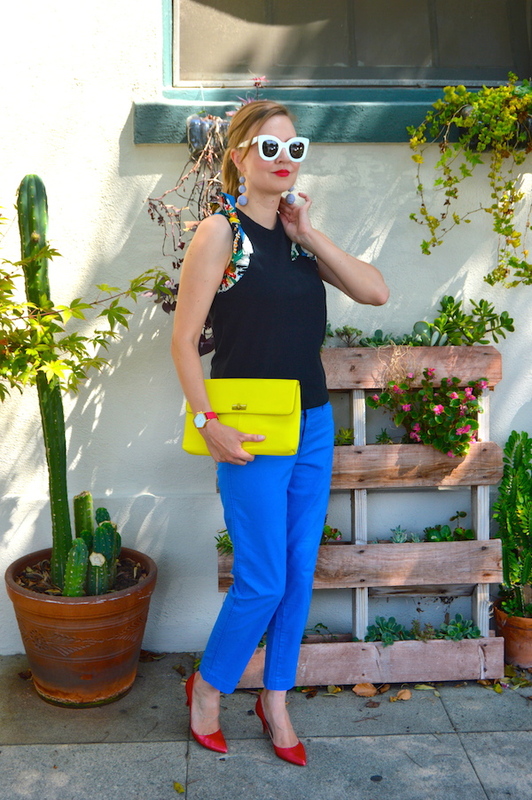 I love the bright print and paired with those bright red shoes makes it a gorgeous colorful outfit! This is such a fun look! The accessories you've paired with the outfit really pull it all together. I especially love those sunglasses! They compliment your face shape in such a lovely way.